Fresh off the high of finishing my Whisper Cardigan last week (pictures and post to follow as soon as I get some photos taken), I decided to tackle another UFO lurking next to my couch. This time: my handspun Stasis Pullover, aka my P3 Today's (not)Sweater. When last discussed on the blog, I had just come to terms with the fact that my swatch lied to me I didn't swatch properly, and had ripped out the four inches of sweater that I had to start over again with my new gauge and numbers from a smaller size. I managed to get most of the way through the waist decreases on the new version, which then sat in a crumpled pile for about 6 months. Last night I picked it up again, determined to get some good progress made. Then I realised (after referencing my spreadsheet that I was supposed to follow for both stitch AND row counts) that I had completely f-d up the waist decreases. Given my much-larger-then-called for row gauge, I was supposed to decrease every 8 rows. I had managed to ignore that directive entirely and go with the every 18 row decrease spacing called for in the pattern. Fabulous. So I pulled the body off the needles to rip back to 8 rows about the first set of decreases so I could get them sorted out. And as it was lying in my lap, I had a sudden, terrifying thought: "You know, this looks kind of big..."
So I pulled out my trusty tape measure and checked. Several times. And discovered, in fact, not only was it "kind of big", my spreadsheet-calculated with-my-gauge measurement of 42 inches was actually...(wait for it)...46 inches. W.T.everloving.F!!!????!!! Now here's the kicker - my gauge is still 6 sts/inch, but the sweater is coming out 4 inches too big. 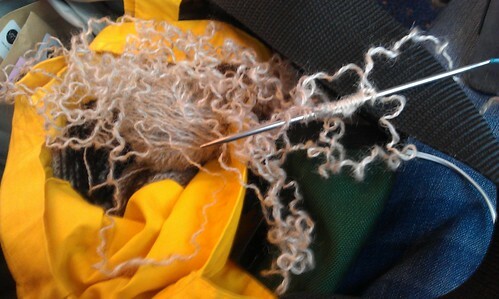 Either I cast on some bastardized number of stitches, or gremlins are coming and stretching my sweater out when I sleep. After much wringing of hands, gnashing of teeth and tearing of hair, I ripped out again, cast on the number of stitches for the size 37, and got most of the way through the ribbing. This morning, on the train, I realized that I cast on the number of the stitches for the body (240) not the number of stitches required for the ribbing (228). I am beginning to think that this sweater is cursed. Truly, truly cursed. And I'm not sure it will be finished by October and the next installation of P3/Today's sweater. Written by porpoise On May 20, 2013 In "handspun", "sweaters", "the best laid plans of mice and men"